Holy Cow! 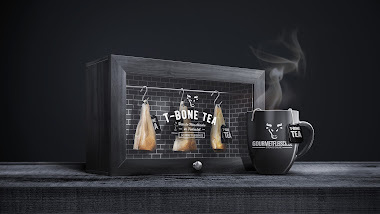 The German online meat shop Gourmetfleisch.de and Jung von Matt/Neckar created beef bouillon in teabags. The tea does not only say good-bye to the same old boring ingredients like ordinary green leaves – it also revamps the traditional looking tea box packaging design. To put the bags into the right environment, we turned our tea boxes into a miniature butcher shop complete with tiny meat hooks. The meat hooks not only pay homage to the butcher shop atmosphere but they are also a handy little device for hanging your teabags into the pot. Style and colors, of course, had to match with the overall dark vintage brand feeling, while still portraying a premium and clean look. A whole new product now comes with a whole new taste and aesthetic. Bon appetite! Style and colors, of course, had to match with the overall dark vintage brand feeling, while still portraying a premium and clean look. A whole new product now comes with a whole new taste and aesthetic.